DS-Z Series digital signage computers are a very cost effective way to add digital signs in your business. DS-Z systems support from 1 to 11 independent displays with the same or different content on each screen. We have options that allow you to extend video up 300′ away and easy to use. Simply connect your new or existing TVs or monitors to the multiple video ports on the DS-Z system. Create your media content to be displayed using Microsoft PowerPoint (included) or your own software. The content can be anything from simple text and still images to a fully animated presentation. Monitor 1 is designated as your ‘Control Monitor’. This is where you will create and control your content. DS-Z series systems support, VGA, DVI, HDMI, or DisplayPort. This is based on the available connections on your TVs or monitors, and will determine what type of video cards we use in your system. Full details available on the individual system pages. Our optional Video Extension Modules allow you to extend video and audio up to 300 ft away from the system (see example below using HDMI extenders). 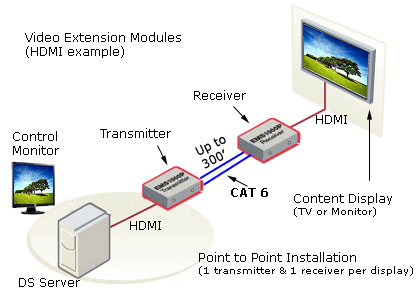 Distance is determined by the type of connections that you are using on your content TV’s or monitors. How Many Content Displays Do You Need? Also See Digital Signage FAQ.